Dr. Norman Geisler is one of my favorite writers because he writes with great clarity. I was expecting a little more than what was presented in this book, but this book is informative and concise nonetheless. Allow me to say, that I do not think that Geisler and Betancourt are seperated enough on this issue of Roman Catholicism and Evangelicalism, and I would warn you not to think that the differences between the two religious system to be merely preferential, or superficial. Indeed there is a great gulf fixed between the two, that is the differences are doctrinal. Also I reject Geisler's idea of the body of Christ being the universal church (which is inevitably the ecclisiology of Protestants) thus creating a church within the church. The strengths of this book lies in the historical and doctrinal refutation of a few albeit major claims of the Roman Catholic church: Papal Infallibility and Peter's primacy. Very interesting read. 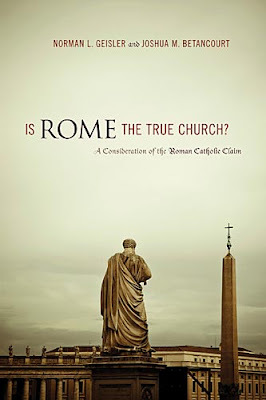 Chapter 7: Is Rome the True Church?